Only a few days back from an Alaska Cruise. Still adjusting to time change and in de-tox from massive amounts of food. Our first cruise and it was a dandy. First class all the way except for the air flights. However, even the flights were all on time and hassle free. A relatively small ship of 685 passengers with a crew of over 400. The food was outstanding, the company was delightful and on board entertainment was first class with a new show every night with a live band. Upon arrival at Seattle we were transported to the ship by a witty tour bus operator and soon settle into our state room. Cozy but quite functional with a substantial window view of the surroundings. After an almost immediate safety drill we were free to fully explore the ship. Several first class restaurants and cafe and other food service locations were available. Eleven decks gave us a plethora of viewing sites. Pool, hot tub, putting green, ping pong and shuffle board for diversions. And a magnificent library stocked with the latest bestsellers. Afternoon tea the order of the day a 4:00PM. From Seattle we sailed to Ketchikan, Alaska our first port. Ketchikan is an island with about 10,000 residents near the Tongass National Forest. Fishing and lumbering dominate the economy along with tourism. Our tour in Ketchikan included a Lumberjack Show on the pier and a native culture visit to a long house and totem pole park. Learned about the indigenous culture of the Tclingit peoples. Nancy even got to dance with them in a ceremonial dance with a native costume. The visit also included a demonstration by the totem pole master carvers. After the glacier we head south to Wrangell, Alaska as the second port of call. During the sailings we enjoyed socializing at the dinners and lunches. 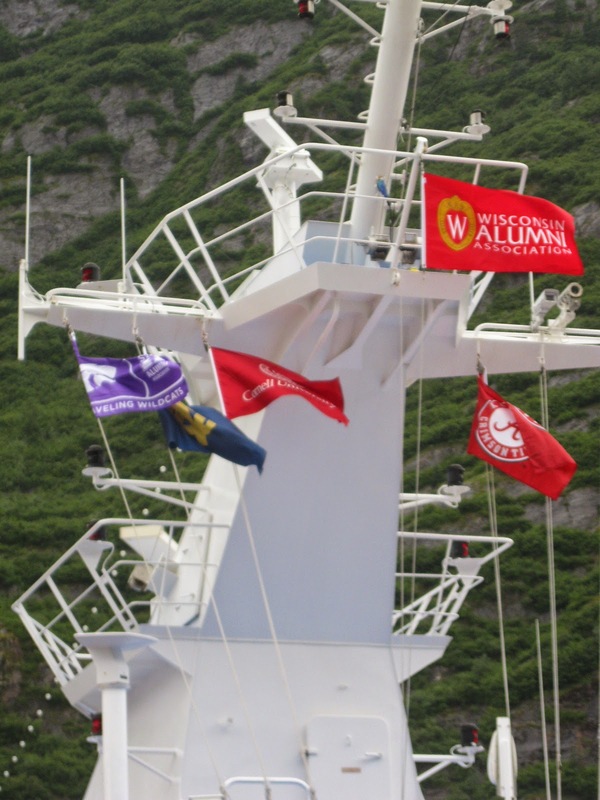 Many of the cruisers were members of university alumni groups as we were included in the forty or so Cornell Alumni hosted by Terry Hahn of the Cornell Alumni support organization. Terry and Cornell provided a wonderful evening reception with champagne, goodies and pictures. We also had a group dinner one evening with singing of Evening Song and the Cornell Alma Mater. During our Wrangell visit on an island with about 2000 residents we walked the town a bit and visited further indigenous sites and a museum. More totem poles and visit to a beach with petroglyphs from 2000 to 10,000 years old. From Wrangell, Alaska we cruised further south in the inner channel to Prince Rupert, British Columbia for our visit to Canada. Prince Rupert is a beautiful city on an island as well. We were greeted as we left the ship by the Mayor flanked by two lovely Canadian Mountie women in splendid dress red. Our Prince Rupert stop included another indigenous culture museum visit and a stroll through a beautiful seaside memorial park. Totem Park, Prince Rupert, B.C. Mayor, Mounties and Friends, Prince Rupert. B.C. Regatta Ship in Background of Memorial Park, Prince Rupert, B.C. With an evening departure from Prince Rupert we moved into the outer channel out to sea fro our run to Seattle. On the open sea for the first time we encountered enough of a sea to have significant motion of the ship. Both an up and down and rolling motion. Need to have some sea legs. After a night day and night of sailing we arrive in Seattle to disembark from a glorious journey. In retrospect, it is hard to capture all the feelings and experiences of the journey in a narrative. For us it was wonderful first cruise experience. Who knows we might do something like this again. Of course it will have to be during the off ski season!